Natural crystals more frequent than all prismatic. Colors white or light pale grey. In structural attitude toward Cottunite laurionite is near, whose clear white or colourless crystals found out mainly in emptinesses ancient plumbiferous dumps, exposed to the action of salt water on a coast at Lavriona in Greece. In these dumps laurionite be found with such characteristic minerals, as paralaurionite, fiedlerite and penphildite. 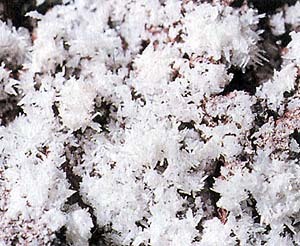 Cottunite will dissolve in hot water from which brilliant crystals fall out in-cold. Yellow falls out at affecting solution of dichromate of potassium, gold sediment. Noticeable radio-activity which is revealed in standards from Vesuvius especially interesting. Cottunite is present mainly as aggregates of crystals in modern fumarole near the crater of Vesuvius (EU). It appears jointly with the chlorides of copper and melaconite (tenorite). Rarer he be found as an oxidate galena, galenite outdoors in presence chlorides. Such cases are known in a few places in Chile or not far from a seashore (a peninsula Kornuoll).